Our experienced and caring pediatrician and nurse practitioner provide a full range of health services focusing on holistic care within a medical home. Our dietitian works closely with the medical staff and patients to provide a family-centered program for a healthier lifestyle. We care; no concern is too big or too small. Our kid-friendly and welcoming space feels like home and features whimsical art throughout to create a most pleasant experience. We believe reading is essential to a child’s development. New or gently used books are given to each patient. Throughout the year we host special events and provide our patient families with little extras to show we care, including: backpack giveaways, health fair, holiday party, gifts of winter clothing, toys, meals, and more. Our special four legged friends help make the clinic visit a positive and enjoyable experience. Flu can be very dangerous for children. CDC estimates that between 6,000 and 26,000 children younger than 5 years have been hospitalized each year in the United States because of influenza. 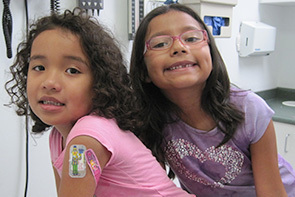 The flu vaccine is safe and helps protect children from flu. CDC recommends that everyone 6 months and older get a flu vaccine every year.